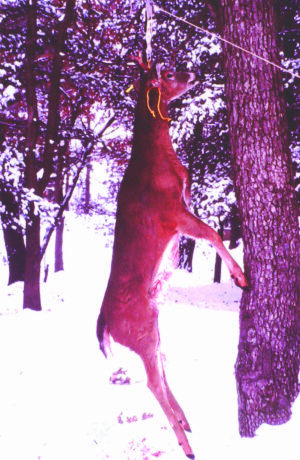 A particular winter came along, the bow season was still open, and neither me nor Rog had put a deer in the freezer. It was December 31, 1971 and a New Year was in the offing. There had been a lot of snow this winter, and I mean a lot of snow, and walking in the woods and fields was almost impossible. But, I had a spot where it wouldn’t be too hard to get back into. 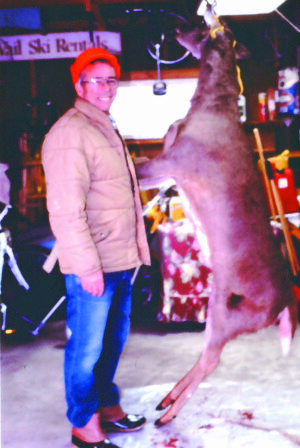 It was a little farm in Waupaca County and the old man and his wife had always given me and my friends permission to hunt there. In fact, me and Rog had “filled up” during a late winter bow hunt once before on their farm. Thinking back, I know that both me and Rog have thoroughly enjoyed, and still do, sitting on a branch of a nice tree on a nice 25 or 35 degree day, in the sunshine, no wind, and not so bundled up that we can’t pull our bows. I know I can’t say it’s “right next to heaven,” but it seems that it could be pretty close. Of course, having a nice deer trail or cornfield real close always helps matters quite a bit. This was one of those days. 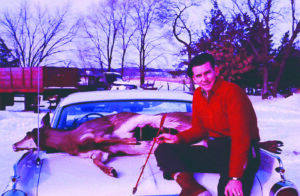 We took my Pontiac Catalina, four-door hardtop, which had a real big trunk, plenty big enough for a couple of dead deer and a roof rack for our skis. (I couldn’t buy a new car today, because you can’t fit a deer in the trunk.) I had new snow tires that were “studded” so there was no worry about getting stuck. “Studs” were metal spikes driven into a tire to give the tire more traction. They are illegal today. The “old man” and the “old lady” where still living on the little farm. It consisted of a small kitchen, cozy living room and quaint bedroom with an attached woodshed. He was still able to get the little “Alice” Chalmers tractor to box, bop, and top along in the spring so he could get his little corn crop planted and a few other vegetables. Though he worked hard at planting and caring for the crops, as fall arrived and harvest time, he never, for whatever reason, completely harvested the crop. I always thought he didn’t harvest all the crop purposely so he could have all those deer come to the field for he and his wife to see, and that was why it was such a great place for a late winter bow hunt. So, me and Rog head out on our skis to the corn rows and the pine tree wind breaks to set up, get comfortable, and wait for some nice plump does to come within our bow range. It was a beautiful day so far. The deer were coming into the corn and vegetables big time. And it was exciting just trying to make up our minds as to which trail or feeding spot we wanted to sit on. I settled for a pine tree I had used several times before, and Rog went east across the cornfield to an oak tree on the ledge of the field. The oak woods were behind him, so to speak, and most of the deer would filter out from there. The snow, being as deep as it was, the deer were sticking strictly to the trails. These trails were wide and packed down (you could walk on them as though you were on a sidewalk). My situation was different, as the deer, which bedded on an oak island west of me, had to cautiously cross a large open field, then cross a town road, pass through some scrub trees two windrows and finally be in the corn in front of me. And so the hunt was on. The deer began showing up quite early. They were hungry! They filtered in from many directions and began feeding, digging out vegetables and nibbling the corn on the stalks. Now and then a couple of does would kick at each other and even stand on their hind legs and “span” with their front hooves. You know something like, “I got here first, and you find your own corn.” It was quite a show and one that a hunter never tires watching. Eventually, however, we were both in the mood to finally have a fat doe range by us and afford the shot that would mean venison in the freezer. I didn’t see or hear Rog shoot, but once I did, he gave me the signal that he had arrowed a deer. Then, seemingly only a minute had passed, and my giving Rog a thumbs up, that a nice doe came by me and I, also arrowed one for the freezer. I don’t believe either of us immediately realized the job we had ahead of us, as far as getting these deer back to the car. We first had to tramp the snow down around each deer so we could have room to field dress them. Secondly, we had to go back to the field to retrieve our skis and thirdly, try to ski and pull these deer out without having a heart attack. Our ropes were too short and it turned into an ordeal because the deer would ride up on the back of our skies and jerk us back, time and time again (no snowmobiles for us then). However, we prevailed, although thoroughly wet from sweat and damned tired. But, we were happy!! With two nice deer in the trunk, skis tied to the roof, and thanks and goodbye to the land owning old folks, we took the easier trip home, Waupaca and Highway 10 to Oshkosh. Upon arriving home we hung the deer in our garages and checked them in. Skinning and butchering, we figured, could wait till the next day. A quick shower, some nice clothes, maybe a shave and we were ready for our friends New Year’s Eve party, and did we have a fun story to tell those folks. 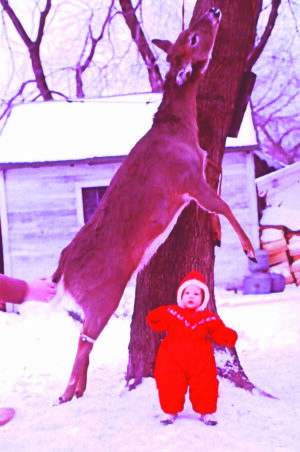 The “old lady” died shortly after this hunt. Then, as is so often the case, the “old man” died a few months later, in the spring. Thus, no more corn planting, no more “veggies” and the late winter deer hunting spot was gone. I recently drove by this homestead and all is gone. The house, the cow barn, the silo, and all the other out buildings are gone. Even the large asparagus path that ran along the ditch in front of the house is gone, as well as the lilac bushes, and the tiger lilies that grew wild along the road. Now, a brand new ranch style house with a long winding driveway occupies the property. Things change.